Just how do you get a 'monster' to move? The mayor has all sorts of ideas for chasing it away. But soon he has to think again... A warm and witty fable from the author of CHEER UP CHICKEN! and A NIGHT THE STARS DANCED FOR JOY. About "Time to Go, Hippo!" 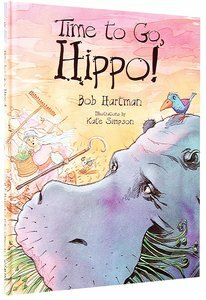 When a hungry hippo arrives in the rice field, everyone wants to get rid of him. But when the farmers, hunting dogs, and the army are unsuccessful, the wise Father Benno comes to the rescue.